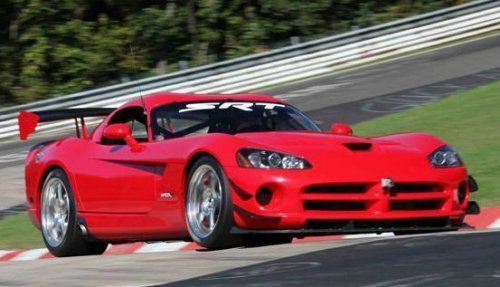 In September 2011, the Chrysler Group announced that their incredible Dodge Viper ACR had reclaimed the production car record on Germany’s famed Nürburgring with a time of just 7 minutes and 12 seconds and yesterday, the SRT division issued a video of the race-only Dodge Viper ACR-X roaring around the track known as Green Hell in just 7 minutes and 3 seconds – making it one of the quickest cars to ever lap ‘The Ring’. The video posted on the Chrysler Division’s DriveSRT Facebook page shows the race purposed Dodge Viper ACR-X (the same one used in the Dodge/SRT Viper Cup) lapping the Nürburgring Nordschleife with a time of 7:03.058 – almost ten seconds quicker than the road going Viper SRT10 ACR. The key differences between the street legal Viper ACR and the Viper ACR-X shown in the video below are an engine tune that increases the power to 650 horsepower with help of exhaust headers and a high flow exhaust system, a stripped out interior complete with a race seat and roll cage and a track tuned suspension setup that works with the racing slick tires. According to Wikipedia, the only vehicles to lap the Nurburgrign in less time than the Viper ACR-X are the Radical SR8 LM, the Radical SR8, the Pagani Zonda R and the Ferrari 599XX. The video below, courtesy of the folks at the Viper Club of America, shows the 2010 Viper ACR-X ripping around every turn of the Nürburgring, including a timer G Force meter and gear indicator in the lower left side and a downforce gauge along the top. Unfortunately, unlike the videos of the Chevrolet Corvette ZR1 and Z06 on The Ring, there is no speedometer on the video but we can bet that the Viper gets awfully near (if not faster than) 200 miles per hour on the long ending straightaway. The downforce gauge is interesting to watch as the Viper ACR-X roars down the long straightaway – with the aerodynamics package on the ACR-X creating over 1370lbs of downforce towards the end of the long stretch. During the video you will also see the ACR-X pulling almost 2 full G’s in the lower left corner ... another incredible accomplishment for this near-street legal car. The next generation SRT Viper is expected to make its formal debut in early April at the New York Auto Show but over the past two weeks, the Chrysler Group has offered a pair of teasers of the new supercar (click here for the front end teaser and click here for the mystery air intake image). As we lead up to the formal debut of the 2013 Viper in New York, we can expect more hype from the SRT division in the form of goodies like the video below and we can hope (and pray, and cross our fingers) for more teasers and information ahead of the debut of the new Viper. The only tidbits of information that we know thus far on the 2013 Viper is that it will pack a high tech traction control system (likely with stability control, etc) and we can expect that it will be powered by a revised version of the Viper V10 with somewhere in the neighborhood of 650-700 horsepower. Anyways, crank up your speakers and enjoy the sweet sound of the American supercar running The Ring.